This is a 12″ to 36″ tall, erect to leaning, perennial forb that rises from a rhizome. It is not a vine. The stems are annual, unbranched, and green, not woody. They are not armed with bristles or prickles. They may have a few short tendrils or no tendrils at all. They do not climb. 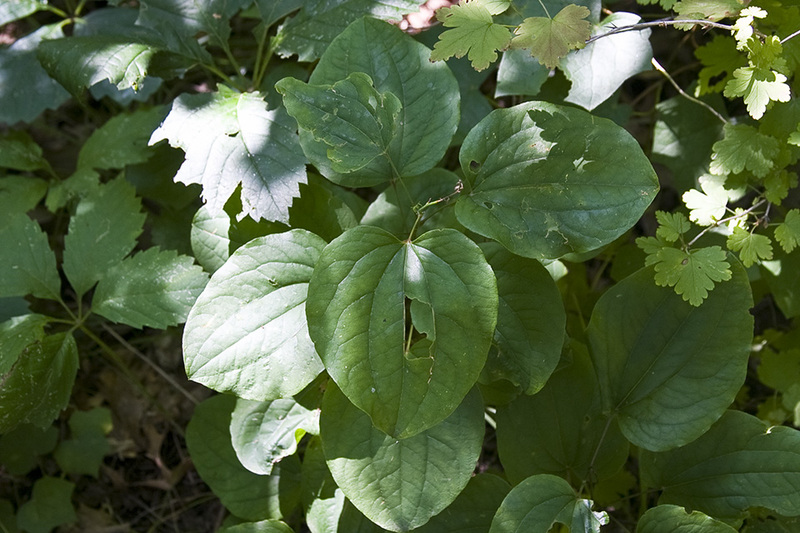 There are usually 7 to 9 leaves, though there may be as many as 20. 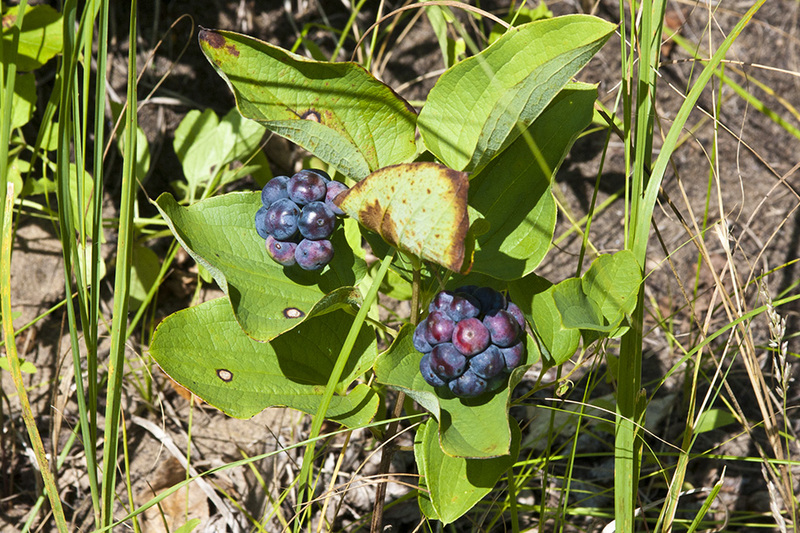 The leaves on the lower portion of the stem are reduced to triangular, leaf-like bracts. The principal leaves are alternate and are more or less crowded at the end of the stem. 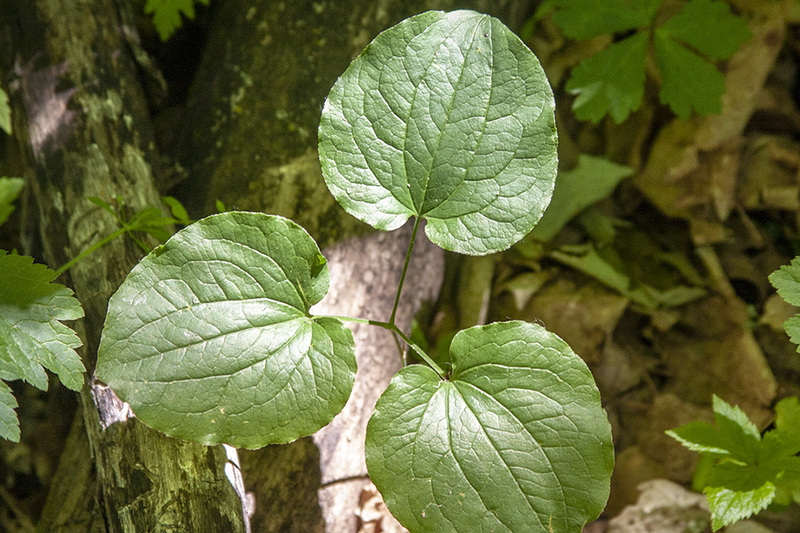 They are on thin leaf stalks that are shorter than the leaf blade. The leaf blade is thin, broadly egg-shaped to almost round, 3½″ to 4¾″ long, and 2″ to 3½″ wide. They are rounded at the tip, sometimes with a short, sharp, abrupt tip, and heart-shaped at the base. 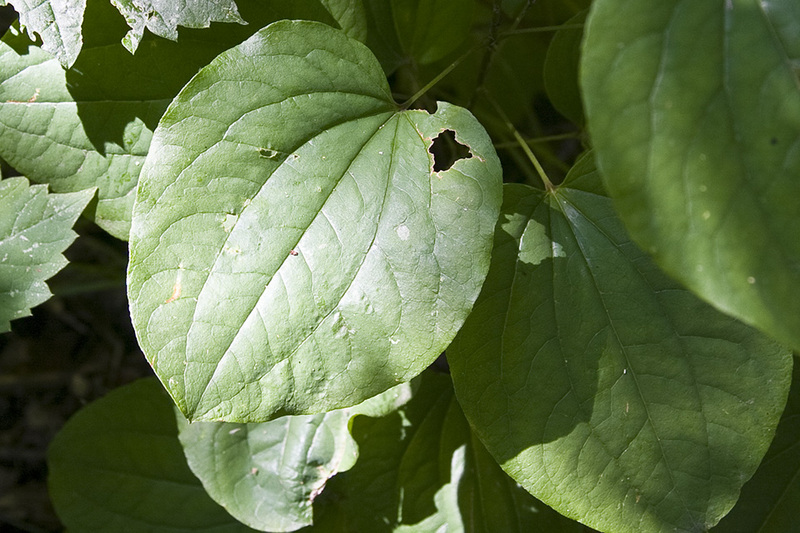 The upper surface is green and hairless with 3 to 7 conspicuous veins that arch from the base of the leaf blade and converge toward the tip. The lower surface is light green or grayish-green, is not glaucous, and is covered with minute, white, flattened hairs. The margin has scattered, minute, tooth-like projections. The margin is not thickened or lobed. The inflorescence is 1 to 3 globe-shaped, umbrella-like clusters (umbels) rising from the axils of bracts on the lower, leafless portion of the stem. Each umbel has 8 to 25 flowers and is on a 2″ to 4″ long stalk. Each flower has 3 green to yellowish-green, strap-shaped petals and 3 similar sepals (6 tepals). The male flower has 6 stamens with yellow anthers. The flowers appear in late May to late June. 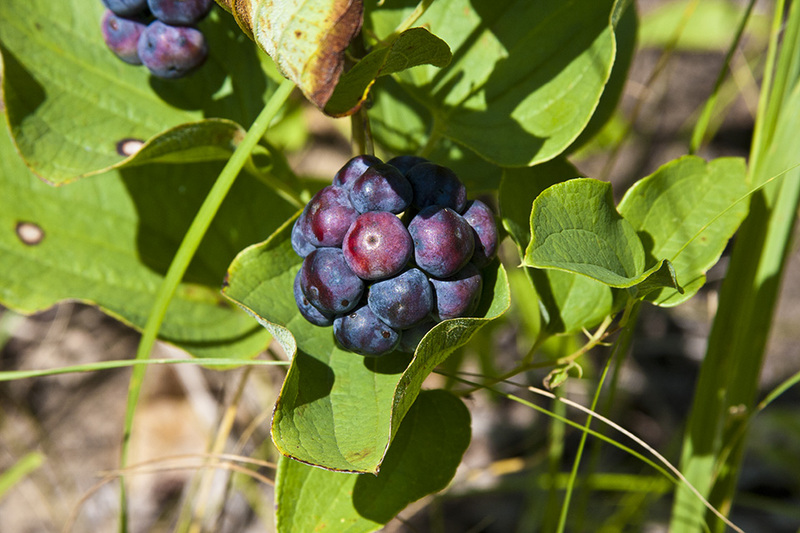 The fruit is a purplish-black, globular berry, ⅜″ to 7 ⁄16″ in diameter. It is usually not glaucous at maturity.